In this episode, Yahnathan continues his discussion with author Starr Burroughs by addressing the question: Why is it important to know what attracts us to people? 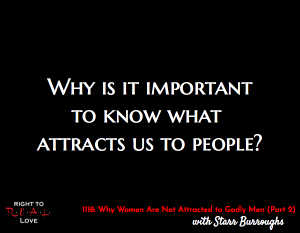 Why is it important to know what attracts us to people? Why it is important for women to know what attracts them to men. How social media impacts what we are attracted to. How fear and insecurity can impact what we find attractive.